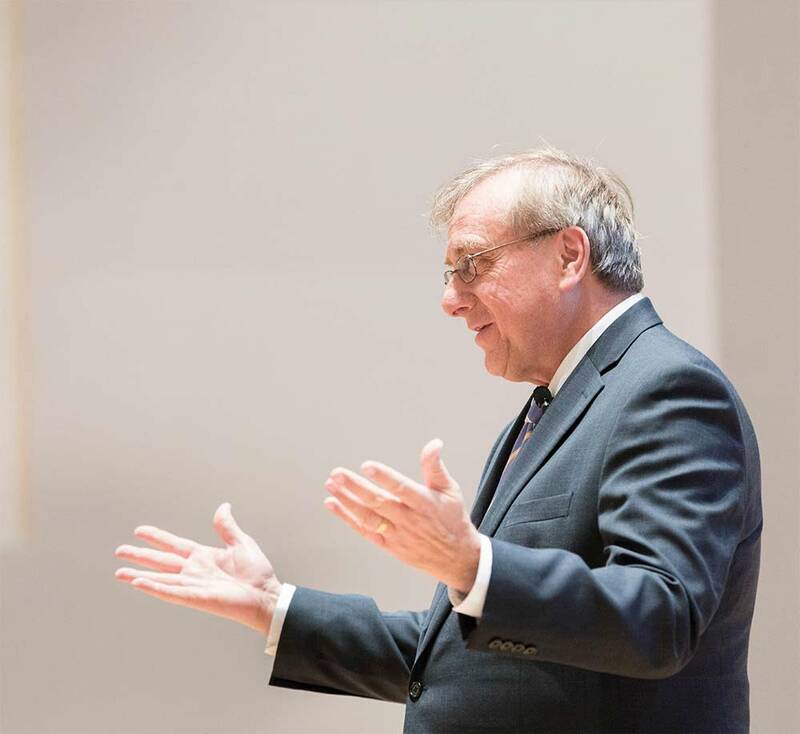 "What stories will the generations after us tell about our generation?," asked UF President Kent Fuchs in his annual State of the University Address in August. Thank you, Professor Vogel Anderson, and thanks to all the faculty and staff who’ve joined us on this incredibly busy start of the new academic year. It is wonderful to see our campus filled with students this first week of classes, particularly those new to UF. As I mentioned in my welcome email yesterday, our new students this fall come from 104 different countries, all 50 states, Guam, Puerto Rico, the District of Columbia, and all 67 counties in the State of Florida. Our new first-year undergraduates were selected from 41,000 applications for 6,600 openings. In addition, UF Online has over 1,000 new students this fall – approximately half in the PaCE program and half pursuing their entire bachelors fully online. This means we have over 3,000 total students in UF Online. UF Online has now graduated over 1,500 Gators with bachelors earned via the UF Online pathway. There are always surprises at the start of the fall semester. Yesterday there was a major plumbing leak at Criser Hall that led to the building’s electrical grid being shut down. UF Facilities Services restored power to Criser and Peabody Halls earlier today. Some staff will return to parts of those buildings this afternoon, while others may need to wait until next week. I would like to thank all of our Facilities Services staff working to return Criser and Peabody to normalcy and all those who responded quickly to maintain student services following the leak, including Enrollment Management, Admissions, the Registrar’s Office, Student Financial Affairs and the Bursar. The president’s State of the University Address is often filled with charts and graphs, a summary of the accomplishments of the past year, along with opportunities and challenges facing the university in the coming year. Indeed, last year, I shared a set of PowerPoint slides showing the 20-year trends in state and tuition revenue to the university. My twofold message was that our inflation adjusted total revenues per student are not at the level of 20 years ago, but over the past 5 years, we have had a steady increase and we have now caught up with our top-ranked peers. This is important good news. I also shared the 10-year trends in number of faculty and staff. Those trends showed last year that our total number of faculty and staff have grown, but our instructional and core faculty have actually decreased. Thus, our current focus on adding 500 faculty. This will bring our student-to-faculty ratios in line with our top-ranked peers and also grow our scholarship and research. I also shared last year what I felt were three important external threats for the coming year: 1) the level of federal funding for research, 2) the possibility of reducing Federal reimbursements for what we call indirect cost (F&A costs), and 3) federal policies that were causing our number of international graduate students to decline. The good news is that the first two threats did not unfold as I was worried they might. Federal funding for the NIH was significantly increased for the first time in more than a decade and several other agencies saw modest increases. I do remain concerned about federal funding for the National Endowment for the Humanities and the National Endowment for the Arts, which have been underfunded across several administrations in Washington. The news regarding international students is not as good. The most significant development over the past year is the continuing decline in our number of international graduate students. This year, there was a slight decline, following last year’s sharp decline. The most dramatic drop was in our students from India, but the number of students from China also dropped further. In terms of colleges, engineering and business have had the most significant decrease. This overall decline in international graduate students is worrisome for our university and for the nation. What’s next for UF? What’s next for each of our departments, schools, programs, centers, colleges and for each of us? Before we consider the future, I want to reflect on the past. Like many of you, in addition to participating in national and international events, I also make an effort to engage with our local community and frequently participate in community events. That was the case earlier this week, when I addressed the Rotary Club of Gainesville, which is celebrating its centennial. It turns out the first president of the Rotary Club of Gainesville, in its inaugural year of 1918, was Albert Murphree, the second president of UF. President Murphree is unique among UF’s 12 presidents in that he is the only one to have a statue on our campus, located in a little courtyard just to the east of Peabody Hall. We have French Fries. We have a Potato. We have Heisman Trophy winners and we have herds of alligator statues. But, fortunately, in my mind, only one statue of a president! I can’t resist pointing out that FSU has many statues of its presidents. They even have a statue of UF President Albert Murphree. This is because Murphree was president of FSU before becoming UF’s second president. Murphree arrived at UF in 1909, succeeding Andrew Sledd, our first president. After five years as president, Dr. Sledd had been fired in a power struggle between two state boards overseeing higher education – the Board of Education and the Board of Control. The Board of Education won the upper hand thanks to the newly elected Florida governor, Albert Waller Gilchrist. The board’s stated reason for firing President Sledd was low enrollment. But besides the power struggle, other issues swirled. Dr. Sledd had written a controversial magazine article arguing the federal government should step in to address lynching and racial inequalities in the South, upsetting many white Southerners. On President Murphree’s first day, July 1, 1909, our campus consisted of just three buildings – Thomas Hall, Buckman Hall and a small laboratory building – forlorn in an open forest of big pines. Thomas Hall, planned as a dormitory, was being used instead as an all-purpose building, with laboratories, administrative offices, the assembly hall, the dining room and the kitchen and library – which was in a cramped room over the kitchen. Patrons could smell the evening’s dinner while browsing for books. There were two dozen faculty and 186 students. One of President Murphree’s first moves was to reorganize this tiny, struggling institution into four colleges – arts and sciences; law; engineering; and agriculture. It was a grandiose vision, since each had only a handful of professors. But he professed faith that naming colleges would help to attract faculty. He was right. Over the next near-two decades of his tenure, faculty ranks swelled as the university created more than half of our 16 colleges. UF erected 46 buildings, including today’s Smathers Library, Anderson, Floyd and Peabody halls, University Auditorium – and the organ built into it. Students and faculty launched The Florida Alligator newspaper and the honor system. They selected the alligator mascot in 1911, staged the first Homecoming in 1916 and composed the alma mater in 1925. In fact, virtually all the traditions that we’ll celebrate anew this fall originated in the Murphree era. From fewer than 200 students in 1909, enrollment swelled to 2,000 by 1927, when President Murphree died in his sleep while president. Despite never having enough resources, numerous controversies, and such major crises as the flu pandemic of 1918, he and the UF community, its faculty, staff and administration, built the pillars of the institution that we recognize today. Many decades of faculty, staff and students followed those of the Murphree years. Their legacy is today’s UF. We now stand on their shoulders. I share this about Murphree and the faculty and staff of that time, because I am asking what we will leave behind for those who come after us. Today, I am asking each of us to pause and ask what will we leave for those who come after us. Why am I asking us to reflect on the future today? It is because, in many ways, we have reached a midway point in achieving some of our stated goals as a university. We are also half-way toward our goal of growing the faculty by 500. There is almost nothing more important to the future of this university than hiring faculty. I am asking, what should we achieve as we grow the faculty, apart from reducing the student-to-faculty ratio and increasing our overall excellence? We have also passed the midway mark in our $3B campaign and will certainly blow past our $3B goal ahead of schedule. So, again, I ask, what’s next? Our faculty achieved a new record of $838 million in research awards, up nearly 16 percent from last year and our faculty are increasingly being recognized worldwide, both within academe and in the public arena. Earlier this year the 2018 Pulitzer Prize for History was bestowed on Professor Jack Davis for his book “The Gulf: The Making of an American Sea.” Jack, would you please stand and allow us to congratulate and thank you for the honor you bring to UF and all of us associated with UF? As I mentioned at the beginning, in addition to the faculty achieving new heights, we also have a dramatically increasing demand for students to attend UF and UF is becoming increasingly selective. Given all these achievements and that we are at the midway point in a number of our goals, I ask that we pause and consider “What’s Next?” I ask, what is it about UF that you would like to change or create? I’m not asking these questions because we don’t have plans for the future. We do have explicit goals and plans. In 2016 a task force of faculty established seven overarching goals, published in a document called “The Decade Ahead.” We also developed the “Metrics that Matter,” to measure our progress through 2025 compared to our top-ranked peers. We furthermore have a specific plan to reach the top 5 of public research universities and we know what it will take to get there. My question goes beyond our current goals and plans. From three lonely buildings in a forest, the faculty and staff at the time of President Albert Murphree envisioned and created a university with many colleges; with an official state museum; with a university auditorium; and even our mascot, the Florida Gator. What might we imagine and how do we want our university to change … not for next year or the year after that … but for a quarter or a half century from now? What stories will the generations after us tell about our generation? When I ask these questions of myself, I first think of many characteristics of the University of Florida that I love and hope will endure and not change. I love that we have over 140 mission-focused units around the state but one historic UF campus, home to all 16 colleges and a major academic medical center. I love having students and faculty from so many countries, cultures, racial and economic backgrounds, sharing and benefiting from their richness of experiences and viewpoints. I love that we have world-class athletics and academics that complement one another. And, my hope and prayer is that we will always remain a university that cares about its people and that we will double down on loving and supporting one another and that we will always care about all the people of this Earth. My question of “What’s next?” is inseparable from a larger and more open-ended one: What’s next for humanity? What will our society look like in the future? At this point, you may be wondering if the President has a little too much time on his hands. But if you think back to history, you quickly see that UF was shaped by its times as much as by its community of faculty, students and alumni. When President Murphree arrived in 1909, horses were the mode of transportation on campus. By 1927, there were more than 15 million automobiles in America and President Murphree was dealing with parking issues on campus. Refrigeration, air conditioning, penicillin, and movies with sound were all discovered or created in the Murphree era. Today, the rate of change has not abated. The past ten years have seen changes as dramatic as in Murphree’s years as president. However, today there is something different than in 1918. Today UF is a powerful research university. We, as members of this university, have the ability to influence the change. I speak frequently of our aspiration that we will be the university that the state, nation and world look to for leadership. We as individuals and together as the University of Florida have the ability to lead in creating the future. In a few days we will announce an initiative from the Provost’s Office that is intended to be a small part of the answer to “What’s Next?” As we think about the second half of our fund-raising campaign, and as we think about how we can enable UF to be viewed as the nation’s number one university for comprehensive excellence, we are creating a concept called “The Platform for Life” and associated “Moonshots” – initiatives to tackle difficult problems important to society. Provost Joe Glover will describe “The Platform for Life” and the “Moonshots” in detail in our September Faculty Senate meeting. I started my talk by referencing our new students. We also have hundreds of new faculty and staff. I would like to acknowledge those new faculty and staff. If there are any faculty or staff new to the UF community in the past year, would you please stand so we may welcome you? I also want to introduce a few specific new university leaders. Last month we announced that Nancy Paton will be our Vice President for strategic communications and marketing. She will join us from the University at Buffalo on October 1. Regarding others, when I call your name, please stand. I ask the audience to hold your applause until all are standing. Mark Kaplan, VP for government and community relations. Mark is traveling and not able to be present today. David Nelson, Interim Senior VP, UF Health. David is also traveling. Now, I would also like to recognize anyone in this room who has assumed a new leadership role since last fall. Would everyone who has a new leadership position in a department or college or elsewhere across the university, please stand? Thank you. I conclude today with a simple request. As we begin to address this question, “What’s next?,” for UF, I ask each of you to ask the same question of your own work and time here. What do you want to accomplish this academic year? What should change in what you do and how you do it? What will you leave behind for those that follow you? I remain very grateful for the opportunity to be your colleague, to dedicate myself with you to our students, to each other, and to this university. Thank you for the privilege of joining with you to dream, plan, and work together on building the pillars of the university that future generations will embrace as their own.